After years working undercover for U.S. Immigration and Customs Enforcement infiltrating drug cartels, Oscar Hagelsieb had a novel realization – rather than spend his days looking over his shoulder for criminals that might’ve figured out he helped turn them in by living a private life, he would take an opposite tact. Hagelsieb is a subject worthy of his own film, someone who may have had trouble not being noticed with his big personality, his ornate tattoos and his affection for Harley-Davidsons, but he is also emblematic of the core idea that emerges in Bernardo Ruiz’s latest film, which suggests in the ongoing strife that plagues both sides living immediately around the U.S./Mexico border that only light can truly expose darkness. 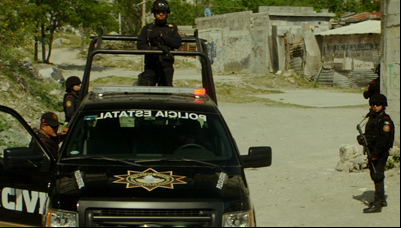 After previously tracking a journalist and his team risking their lives to cover corruption in Tijuana in “Reportero,” Ruiz spotlights three disparate individuals in “Kingdom of Shadows” to show the extent of organized crime, largely fueled by drugs, that recognizes no borders and has reached into every facet of the daily lives of millions who have no direct relation to it. 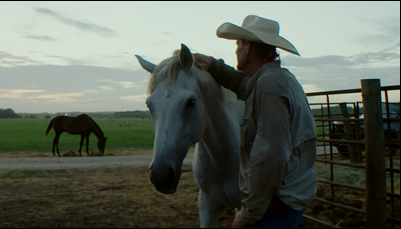 Besides Hagelseib, who specializes in narcotics and intelligence for Homeland Security, “Kingdom of Shadows” profiles Don Henry Ford Jr., a Texas rancher who turned to marijuana smuggling with Mexican gangs after falling on hard times, and Sister Consuelo Morales, a Monterrey-based nun who has made it her mission to help families who have had a loved one disappear. Their stories, as well as the many others with whom Ruiz gets testimony from, form a nuanced look at the atmosphere of fear that allows the Mexican cartels to persist and how speaking out might be every bit as powerful a weapon as the ones they have used against them. As “Kingdom of Shadows” makes its way into theaters following a successful debut earlier this year at SXSW, Ruiz spoke about how the film came to be, building the same sense of surprise into the storytelling that he experienced while researching it and why he doesn’t consider this another film about the drug war. How did this come about for you? How did you decide what those three stories would be? Probably like many filmmakers or writers, we all have our back pocket stories. For a long time, I had been fascinated by the story of Don Henry Ford, Jr., who was a cowboy smuggler. I had been in touch with him for about eight or nine years, knowing that one day if the timing was right, I would want to focus on him, in part because I feel like his stories so unusual – people see him and they think John Wayne or as a typical Texan rancher. They don’t realize that he was a smuggler for the Juarez cartel. So I started with him. Then on the other side of the border in Mexico, I was reading a lot about Sister Consuelo, a human rights defender in Monterrey who working with families that disappeared, so I met with her and the families and I gauged the possibility of filming something with her. When I started to think what would it look like to have a film with a smuggler from Texas and this nun from Monterrey, I felt I needed a border story that could connect these two in some ways. Two colleagues of mine who are great veteran border reporters – Alfredo Corchado, who’s with the Dallas Morning News, and Angela Corrallo, said, “We think we have someone you should meet” and they asked me to fly down to El Paso. They told me I was going to meet a federal agent, but I didn’t know what he was going to look like, so I showed up at a cafe and I waited and waited. To be honest, I was waiting for what I assumed to be a white, square jawed guy in a suit, and when Oscar came in, I didn’t notice him because I wasn’t looking for him. Soon enough, I felt a tap on my shoulder and there was this guy with tattoos up his arms, wearing a biker chain and a baseball cap. To a lot of people in this country, he would look like a “thug” or a biker, and as I started pre-interviewing him, I realized that, wow, this is a federal agent and his story was an organic bridge between this human rights defender and Don Henry Ford, Jr. I love that these stories all defy easy stereotypes – Don Henry Ford is not your typical American cowboy, Oscar is not the federal agent that most people think of, and Sister Consuelo is not a meek, quiet nun. Did your own sense of revelation contribute to the style of the film that reveals the story bit by bit? Absolutely, I wanted the audience to meet Oscar the way I met him. When we first meet him, it mirrors how I met him – he’s on his Harley and the last thing that you’d think about him is that he’s a federal agent. Then little by little, he starts to reveal pieces about him, for instance how his parents were undocumented, but then Oscar became a border patrol agent deporting people just like his parents. All of that gets at a kind of complexity that I was after. Like “Reportero,” this also seems to suggest that coalition building outside traditional channels is the way to solve problems. Has that actually been important to get across? I would say that that emerges more from the stories themselves, but maybe I’m attracted to those stories for a reason. Obviously, there’s no end in sight for the Narco conflict or the drug war, but we can begin talking about reducing harm in communities on both sides of the border. In Mexico, the key issue is strengthening human rights, so I think Consuela’s story is emblematic of many stories in Mexico. There are many activists like her fighting for social justice, but they don’t really get the kind of international attention that they need, so I think you’re right, it’s only by building these kind of coalitions and gathering this international support that someone like Sister Consuelo can do what she needs to do. There have been a lot of films that have been about the drug war lately, many of which have focused on the more violent aspects of it. Did you take into consideration what others might be doing to do something different? Yes, I definitely made a conscious choice to make a more meditative film, even before some of these other films had come out. As a personal subject matter for me – I was born in Mexico, my father’s from Mexico and my mom is American – I’ve gone back and forth in many ways between the two countries and I have a connection, for good or bad, right or wrong, between these two places. For me, the film is actually more about the relationship between the US and Mexico than it is the drug war. I wanted to make a more thoughtful, quiet film that would reveal itself over time because I think we don’t have enough of that. We don’t really have that more thoughtful conversation about this conflict, and part of the conversation that we’re not having is how deeply connected the US and Mexico are. Mexico is the second or third largest trading partner of the United States and there are deep demographic, cultural, and economic ties between the countries. Often times, politicians love to create these warring camps and sometimes that extends to other films. The reality is much messier and that’s part of what I was after in the film. The way you show the families who have had relatives disappear is extremely powerful, and so simple – what was it like to meet with those families and film portraits of them? That was a really organic outgrowth of just spending time there. One of the first things I did when I arrived in Monterrey was attend these weekly sessions that Sister Consuela has with the family members. They sit around in a circle on these steel foldout chairs and they talk about their cases, and then they start talking about their children. Almost immediately, I was struck by that – the combination of profound sadness that they have, of course, but at the same time the fact that they haven’t given up and they’re still pushing for justice. That combination of loss but dignity I found so powerful emotionally, and also representative of where I think Mexico is right now. So it wasn’t hard to know that the best way to [depict the families] would be to just do portraits. Everything that I’m trying to say in words right now is visible in their faces – those complex emotions -and that’s ultimately why I chose to close the film with those images because to me they’re the most potent ones in this film. “Kingdom of Shadows” opens on November 20 in Los Angeles at the Downtown Independent and the Laemmle Pasadena Playhouse 7. It will open in San Diego at the Media Arts Center on November 27. It is also available on demand and on iTunes, Vimeo, Google Play, YouTube, Amazon and VHX. Interview: Nick Berardini on the Trouble with Tasers in "Killing Them Safely"